Marseille-Rabat, 29 June, 2017 – The Government of Morocco and the World Water Council launch today the 6th edition of the King Hassan II Great World Water Prize – one of the world’s highest distinctions in the water sector – to reward excellence in “Cooperation and sound management in the development and use of water resources.” The winner will be granted a US$100,000 award. As for each of its previous edition, the Prize will be handed out during the Opening Ceremony of the next World Water Forum – to be held in Brasilia, Brazil, 18 to 23 March 2018. The topic of the 2018 edition is “Working towards greater solidarity and inclusion in order to ensure water security and climate justice.” The contribution may be scientific, economic, technical, environmental, social, institutional, cultural or political. Candidates must be nominated by at least 2 individuals and/or organizations, with thorough knowledge of the qualities and accomplishments of their candidate in line with the Prize theme. Organizations or institutions as well as individuals or groups of individuals are eligible. 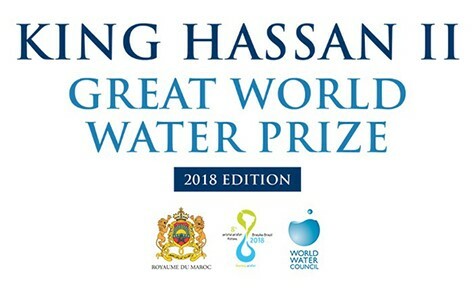 This Prize honors the memory of his Majesty King Hassan II of Morocco and his strategic vision in terms of protection and sustainable management of water resources. Since its creation in 2003, on the occasion of the 3rd World Water Forum, a permanent committee composed of representatives of the Kingdom of Morocco and of World Water Council members oversees the organization and international promotion of the Prize. Houdeifa AMEZIANE, President of the University Abdelmalek Essaâdi of Tetouan. Abdou Maman, director of Tech Innov Niger, was awarded the Hassan II Great World Water Prize for his integrated and innovative remote irrigation system. Thanks to a technological device combining mobile phones and solar panels, which allows farmers to remotely control the irrigation of their crops, social entrepreneur Abdou Maman provides a concrete solution to issues related to the food, energy and water nexus. The solution enables farmers to save time and energy, expand the area under irrigation, increase their production and income, and streamline the management of irrigation water. SSO is an independent international organization based in Tunis. It was founded in 1992 to improve early warning and monitoring systems for agriculture. SSO has placed particular importance on aquifers of large shared basins and on implementing the North-South-South partnership framework in order to strengthen the fight against desertification and reduce the impact of droughts. SSO has developed an innovative regional approach based on the notion of “basin awareness” for the management of water resources shared by its member countries. CEO of the Board of the Arab Fund for Economic and Social Development, Mr. Al-Hamad was honored for his outstanding contributions to advancing cooperation and solidarity in the fields of development and management of water resources. At the time Development Director and Deputy CEO of DHI Water and Environment (Denmark), Mr. Clausen was honored for his outstanding contributions to advancing Integrated Water Resources Management (IWRM) on a global scale. He is also one of the founders of the Global Water Partnership, and World Water Council Governor. The President Director of the Agencia Nacional de Aguas (ANA) of Brazil and the Minister of Water Resources and Irrigation of Egypt were both honored for their significant water-related achievements and contributions to the improvement of water resources management. The World Water Council is an international organization that aims at promoting awareness, building political commitment and triggering action on critical water issues by bringing people together, through active hydro-politics, and serving as linkage between stakeholders and decision-makers. The World Water Council, which has its headquarters in Marseille, France, was created in 1996. It brings together around 300 member organizations from more than 50 different countries. It represents a multi-stakeholder water community including representatives from intergovernmental organizations, national governments, business sector, NGOs and water users associations, and academia. Every three years, the World Water Council organizes the World Water Forum in close collaboration with the authorities of the host country. More than 20,000 stakeholders and decision makers from over 170 countries attended the latest edition, in a joint effort to build strong political commitment. The Council catalyzes collective action in between each World Water Forum and guarantees continuity and success from one edition to another. Protecting water resources was a National Priority for the Kingdom of Morocco long before Millennium Development Goals and the sustainable development approach. Among many other projects, the country elaborated its policy for dams and reservoirs aiming to secure the country’s water supply and contribute to its food security, and to its economic and social development. Today, under the leadership of His Majesty King Mohamed VI, the Kingdom of Morocco is developing integrated water resources management policies and implementing innovative and alternative technologies. Morocco is about to overcome its challenges due to water scarcity, increase of the water demand, and the protection of the environment. As a key player in customizing solutions and thought leadership, Morocco has developed North-South and more recently South-South cooperation efforts, offering its expertise and experience to close partners in water resources mobilization, water efficiency (drip irrigation system) and the development of alternative technologies (sea-water desalination, treated wastewater reuse…). Building on its political achievements and international outreach, Morocco had the privilege of hosting the very first World Water Forum in 1997 in Marrakech. The Forum is now considered as the world’s largest water event gathering the international community. Since then, Morocco has participated in all of the Forum’s following editions. Every three years, the world’s most important event on water related-issues gathers representatives from the international community, including universities, research institutes, enterprises, professional associations, governments, Intergovernmental organizations, NGOs, elected representatives, legislators, as well as representatives from other sectors such as agriculture, food and energy. The theme of the 8th edition of the World Water Forum is Sharing Water. The Forum event is the culmination of two years of collaborative work involving stakeholders from all over the world based on 5 processes, namely the Thematic, Political, and Regional Processes, a Citizens’ Forum and, as an innovation for this 8th edition, a Sustainability Focus Group. The thematic process, backbone of the Forum, is articulated around 6 main themes – climate, people, development, cities, ecosystems and finance- and 3 cross-cutting themes: sharing, capacity and governance.